At the weekend, my family and I visited Yorkshire Sculpture Park. Once upon a time (when we had no kids and lived in Sheffield) this was a regular occurrence, nowadays distance makes the visits less frequent. Yorkshire Sculpture Park, and the accompanying Bretton Country Park are lovely. Sculptures (a mixture of permanent collection and temporary exhibitions) are displayed outdoors in a very green and bucolic setting and in indoor galleries. The park endeavours to guide visitor behaviour by clearly displaying, on panels and leaflets, the ‘YSP Code’; the first point of the code is: “Look and touch but please don’t climb or sit on the sculptures.” This is fair and right but creates certain paradoxes. 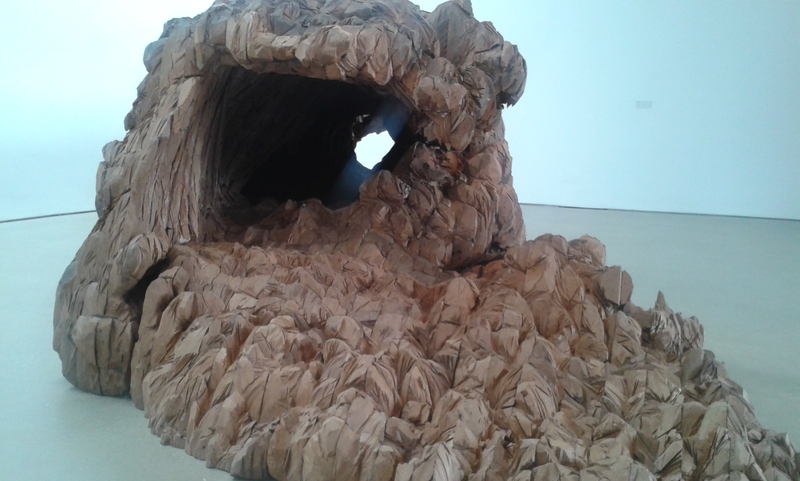 One of the current temporary exhibitions is sculptural work by Ursula von Rydingsvard. I confess that I had never heard of her but I am very glad to have encountered her work. A lot of her sculptures that were displayed in the exhibition were large wooden structures, though she works in other materials. The sculptures were displayed both outdoors, scattered across the grounds, and indoors in the ‘Underground Gallery’. When we entered the gallery there was a man on duty whose job was to cheerfully welcome us and let us know that while we were able to photograph the sculptures we were definitely not allowed to touch. The ‘no touching’ rule was reinforced in more or less explicit ways by the stewards on duty in each gallery space. This ranged from clear spoken directives to more implicit movements of staff into the centre of the space which, I think, were meant to remind us that they were there… watching. The message was clear but very disappointing. The sculptures don’t/can’t call out to be touched but their construction, form and surface texture meant that I really, really wanted to run my hands over them. I didn’t. I can see why the rule is imposed: some of the surface colouring would not survive thousands of strokings. This created a tension within me and my family, not least in the large upright sculpture which contained a narrow enfolding space that we were allowed to step into and encounter in a haptic fashion. We meekly stepped in, carefully turned around, had our experience and then equally meekly stepped out again (rucksacks abandoned beforehand). The steward had placed herself with direct line of sight into the space. At the end of the exhibition, there was a short-film of von Rydingsvard talking about her work, mixed with shots of her at work and of certain pieces in situ. One piece, Damski Czepek, was really interesting. If I understood correctly, the piece was originally constructed in wood then this was used to create a mould from which the final sculpture was cast using polyurethane resin. The piece is monumental in scale but its form is based on traditional Polish women’s bonnets. It was originally placed in Madison Square and, in the film, we saw children playing around it, brushing their hands against it. We also learnt that people had weddings in the sheltered space created by the bonnet – something that von Rydingsvard apparently approved of. Later, as we wandered through the park, we came across Damski Czepek carefully cordoned off. Neither touching nor sheltering were permitted, though the play of light through the sculpture could be admired. Damski Czepek could be touched there but here it can’t..?! To be fair, YSP has often provoked this question though often in reverse. I can touch the Henry Moore sculptures out in the park but not the one on display at the Laing Art Gallery (Newcastle). There is nothing intrinsic to the Laing’s Moore that makes it untouchable, just the rules imposed by the gallery. Though, judging by the patina on the Seated Lady, it seems many visitors cannot resist the sculpture’s surface. Back to Damski Czepek: I can imagine that, if you have a piece on loan for a temporary exhibition, then for pragmatic reasons you would want to treat that with greater care than the pieces that are in the permanent collection. So perhaps this is why Damksi Czepek is cordoned off and other pieces are not. This leads to a question about the rationale behind the ‘YSP Code’… The sculptures are placed outdoors because there is something special about seeing them in different seasons. But that decision (obviously!) creates challenges around the care of the sculpture so.. is the ‘look and touch but don’t climb’ request based on a resigned acceptance that this is the best they can hope for out of visitors or is it based on a belief that actually touching the sculptures is a valid form of engaging with them? In the end, I wonder whether questions only emerge because of the slightly permissive approach that the staff at YSP take. Where stern surveillance prevails and all touch is inhibited, the idea of the possibility of touch is suppressed. This entry was posted in art, museums, Objects, sculpture, touch. Bookmark the permalink.